Last summer, Shelly Welfeld’s mother passed away. She sought solace in morning prayers at Beit Chaverim synagogue. Then she’d walk down the Post Road, along Riverside Avenue and downtown. Along the way, Shelly noticed various objects that looked like letters. She took photos — and soon had enough to complete the alphabet. It’s so beautiful, I asked Shelly to share it here. And so much fun, we came up with a great contest idea. Email your entries to dwoog@optonline.net. Deadline is noon on Wednesday, May 23. If no one gets all 26, the person with the most correct answers wins. The decision of the judges (Shelly and I) is final. Get to work, “06880” readers. The answers are right there, under — and above — your noses. This entry was posted in Arts, Downtown, People, Places, religion, Totally random and tagged Beit Chaverim synagogue, Shelly Welfeld. Bookmark the permalink. Thanks Dan and Shelly! I will never get them all identified, but I think someone artsy in the readership should work with Shelly to produce prints and I would certainly buy one! Really fun. Reminds me of the “Doors of……” posters (fill in the place) I have seen over the years…am in total agreement with Christopher Austin that this needs to be reproduced in poster or print form….it’s very cool…and yes thanks for sharing. This picture is most definitely poster-worthy, with a Westport theme. I am guessing the winner will NOT get all 26! So clever and creative. A “Doors of Dublin” like effort. Thanks to Shelly and you for bringing it to our attention. Good luck on identifying the clues. Love this! It takes a special eye to “See” these things that most folks just walk right by. Great job! This would make a very unique Town of Westport poster! This reminds me of a similar photo collage by Arlene Alda, Alan’s wife. She took photos of natural elements A to Z. This creative project is more locally focused for 06880 readers. 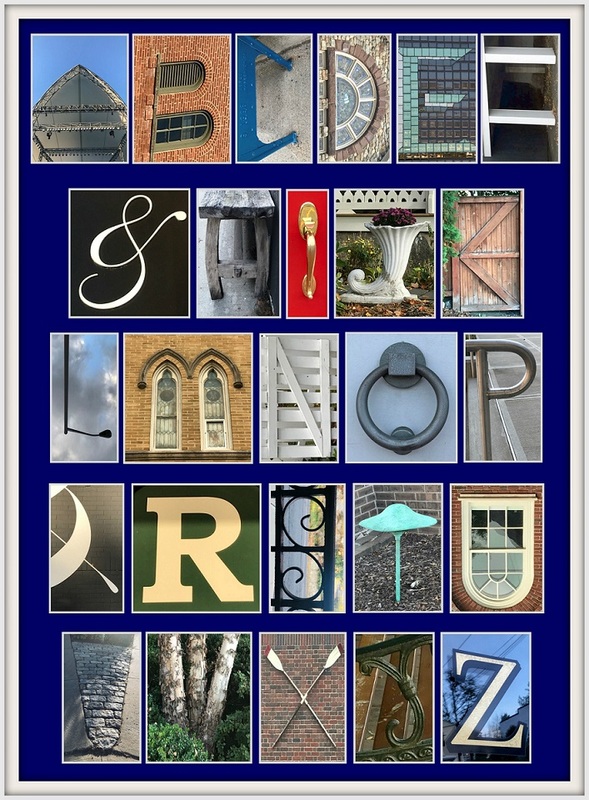 How about a collage that spells out the letters Westport, as a print and/or poster? Is she selling posters of this collage? It’s wonderful! Love it! If it is made into a poster, I hope it would include a key to the locations. That’s great! Wish I had time! Keep the Arts Alive!